We discuss the autumn 2017 anime season as other things pop into our brains. Apologies as my mic is amazingly quiet for almost the entire podcast despite me being so close to it, I could have eaten it at any point. As usual, the podcast contains NSFW content and as such, should not listened to be listened to by most people. There is a audio skip around the 43 minute mark, it’s not a dodgy edit, it’s in the original recording. As I have gotten to the 25 hour mark with this game, I’m enjoying it. While the combat isn’t as good as the previous games in the trilogy (the paradigm system is my favourite FF battle system), it’s an interesting change. It also helped that I picked up a few pointers from looking at the primer section in the strategy guide (apart from the primer section I don’t look at a guide until I have finished a play through myself). I had been making my set ups too similar rather than a debuff/defence, magic and beat the hell out of them set ups that tend to work rather well against the more traditional fodder enemies. What is hard in the battle system are the main bosses. I thought I would do okay as the mini bosses on the lead up were fine. Then the boss wiped the floor with me on my first go. Both the main bosses I’ve beaten was by the skin of my teeth. All out of health items, phoenix downs and EP. They were tricky, but in a nice way. Plot wise, for the most part I’m really liking it. The whole Lightning being Jesus is kinda funny but I’m just going with it. The main quests so far have been enjoyable and mixed things up. Any time I get to name a chocobo I’m happy, I called mine Bruce. Some of the quests can be tricky as the info doesn’t show up on the map and I think this is where the Demon/Dark Souls influence has come in. There is a lot of fetching or looking for items you have no real idea about their location. This might be made easier as like the Soul’s games there is this network that can be accessed online during the game. I haven’t looked into this as I’m worried for potential spoilers. But I got the idea that people could leave messages. Once I’ve finished it, I’ll turn it on when I go for a full run. While the main story is fairly serious, I like that there is some fun to be had in the game. Like making Lightning fight in a coliseum (that spelling looks wrong but it’s what dictionary.com is telling me) in a ball gown or being attacked by cats for carrying a specific potion. 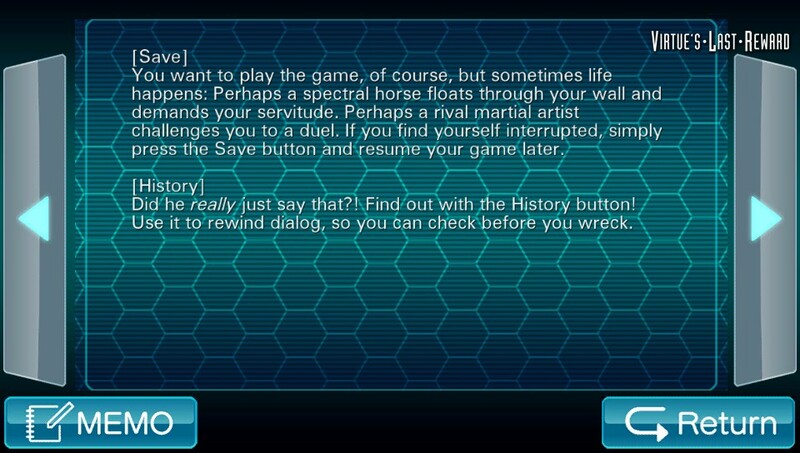 Some of the stories told in the side quests are also nice, though some of the voice acting lines could have been better written. Speaking of voice acting, Ali Hillis, once again does a great job of voicing Lightning and the ever popular Troy Baker returns as Snow, and is also rather good. There is a system in the game that seems to act like Dead Rising. Run out of days and you can start again retaining your health, strength and magic boosts earned previously. Part of me is tempted to run out the clock and start again with my upgraded Lightning, but I’m not sure if you gain the bonuses from missions again so for now I will stick to my normal game. So far, at 25 hours it more positive than at the 5 hour mark, hopefully this enjoyment continues. 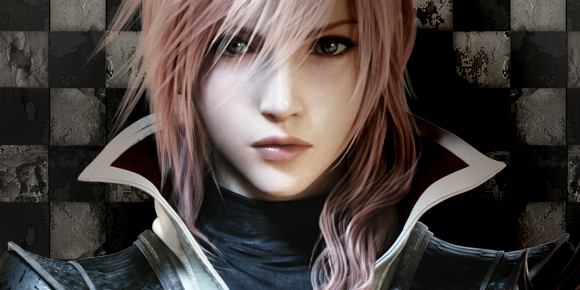 You can guess that as Final Fantasy XIII is one of my favourite games that I would be pretty excited for a new game starring XIII’s main character. I should point out that I have deliberatly not looked at previews and reviews so I could go in knowing as little as possible, so it may be things I talk about change or dont really have an impact. Having played the first 5 hours or so, it’s interesting but like XIII I think it will be a slow build up. 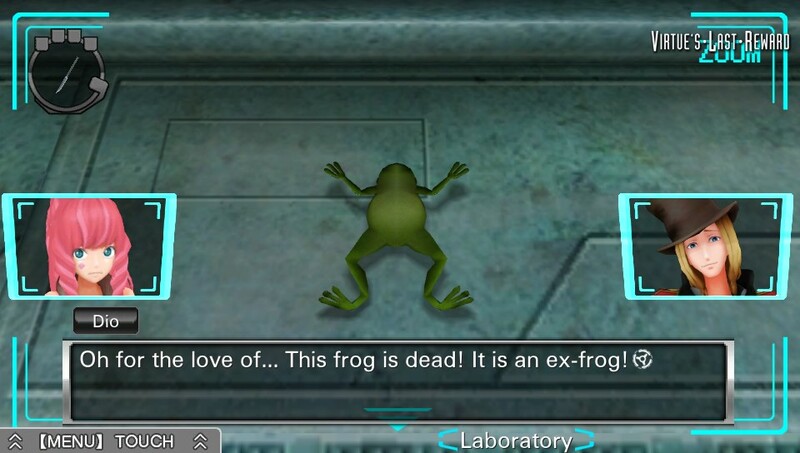 The plot carries on from the story dlc from XIII-2. The non spoiler version is Lightning has 13 days to save individuals until God awakens and destroys everything. There is a lot of talk of religon and heretics which makes for a nice change. The one thing about the plot that worries me is the time limit. Time counts down when you are running around in the areas. Now normally in a JRPG, I like to spend some time in an area levelling up before going for the boss or progressing. With a time limit, this might be difficult but then you find you dont level up by fighting monsters in the traditional sense. You level up by helping people out with their problems. You can also level up your abilities to help but i’ll get to this with the combat. So if you dont go around and deal with peoples problems, come the later stages you could be way underpowered. I like to talk to most NPC’s in a game but this could lead to OCD levels of talking to randoms. The problems i’ve dealt with range from escorting a dude about 25m to get him to work safely to racing a small child. One nice addition is the first main town you get to explore has lots of back alleys and feels good to explore. The combat has yet to really click with me. As this is a JRPG with only one playable character in battle, they have tried to make it more a bit more action-y but it just feels like I can really screw up a fight. You have three different sets of moves, each with their own useage meter. But each set only has four slots which you decide on before battle. Run into an enemy that has a fire weakness but none of your sets have fire spell, tough luck. Its a pretty different system and hopefully its one of those ones that the more you use it, the more it makes sense. The customisation appears pretty epic. You can mix and match outfits, weapons and shields. Then add accessories on top of that. They all have their own specifics to them so no doubt the idea is to end up with one for attack, one for magic and one for use while the others recharge their use gauges. Well thats what I have been using so far. A nice addition is the ability to download the Japanese voice’s via PSN for free. Having played the past two games with the English voices, i’ll be sticking with those. Though if I find myself grinding lots or on a completetionist run through, its nice to have the option. 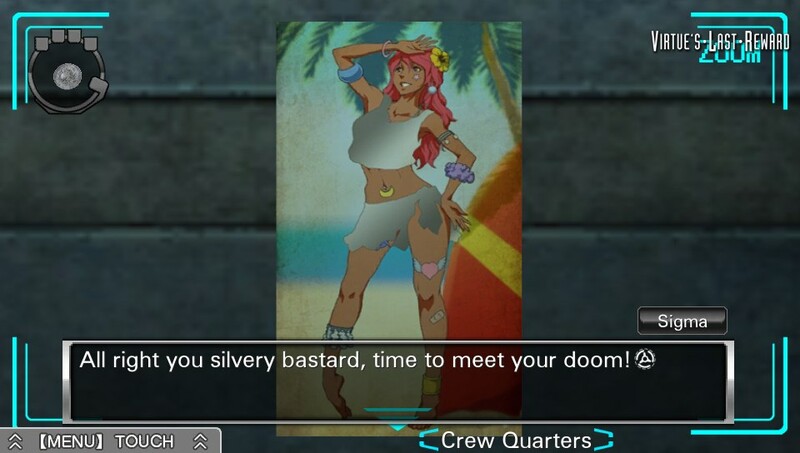 I’m currently around 32 hours of play for Virtue’s Last Reward (VLR) and its proving to be really rather excellent. Its claimed to be a sister game to 999 (which I posted about recently) but so far from playing, its feels nore like a proper sequel. There are some obvious upgrades both visually and audibly. Rather than static 2D pictures of characters they have gone for full 3D models and animated them, including passable lip syncing. Which is nice during long conversations but they arent used enough to show goings on in the story. 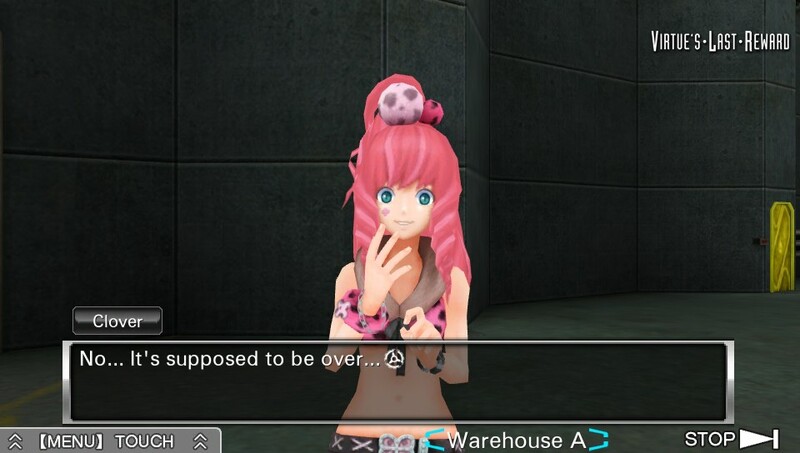 Audibly, the characters are now fully voiced, but only during the visual novel sections of the game. Would have been nice to have them in the adventure sections as the voice actors and actresses do a really good job of bringing the characters more to life. All the voice talent is really good, though I am a bit biased for a couple of characters as they have used some anime seiyuu I really like (yep – fanboy I know). For the UK release it also retains the original Japanese audio, which I thought was a really nice touch. The Vita has a built in screen capture function so I used it to grab some pictures to illustrate a few of the more humourous examples why I like it so much. 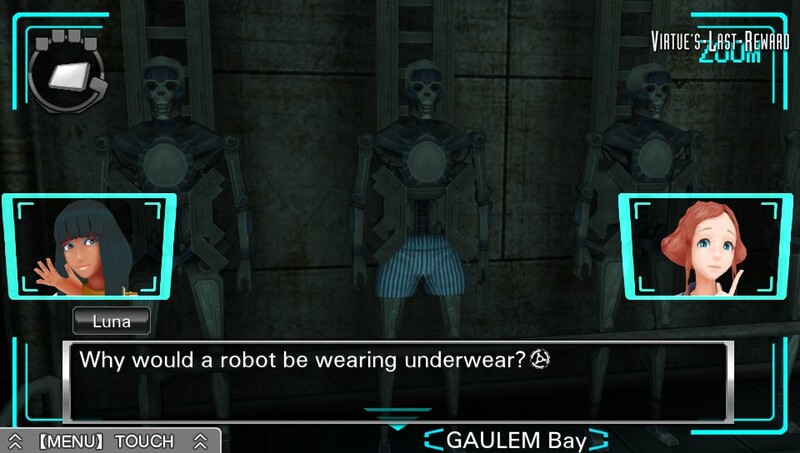 I should point out that while there are moments of humour, its a fairly serious game. I hadn’t intended to play 999. Back in November 2012, Rising Star games published Virtues Last Reward on the Vita and 3DS. Being a Vita owner and back last year, new games werent amazingly frequent so I looked into it. 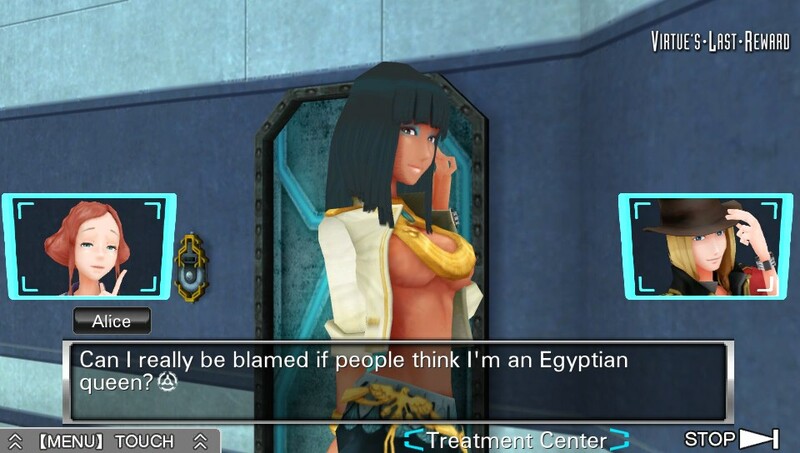 It turns out I had downloaded a promo video from the Japanese PSN for Virtues (from here on I will refer to as VLR) and thought it looked interesting. I say interesting, the video seemed to consist of an mad rabbit seemingly telling people to die. Admittedly my Japanese is very limited (Scott has witnessed this firsthand so he can back this up) but it was enough. I preordered the game. The guys from Epic Battle Axe said it best – yote with your wallet (check out their podcast Epic Battle Cry – its very good). If I want to see more of these Japanese curios translated then I have to lay down my cash. Around this time I start hearing about Nine Hours Nine Persons Nine Doors (from now on 999 as i’m lazy). 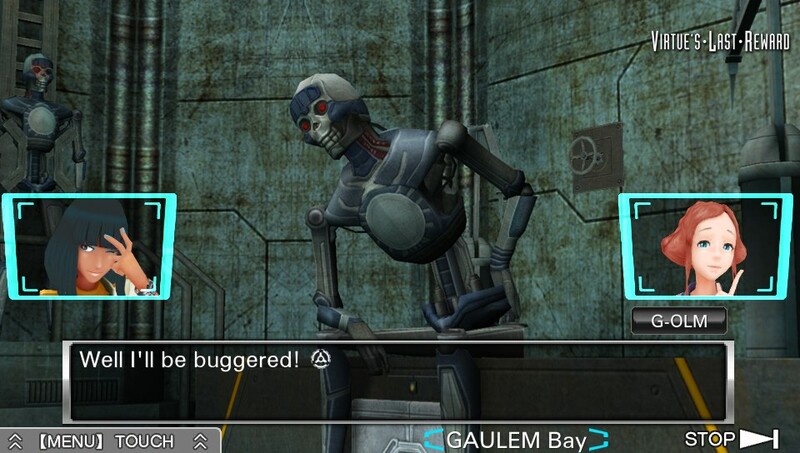 Both VLR and 999 are part of the Zero Escape series of games. 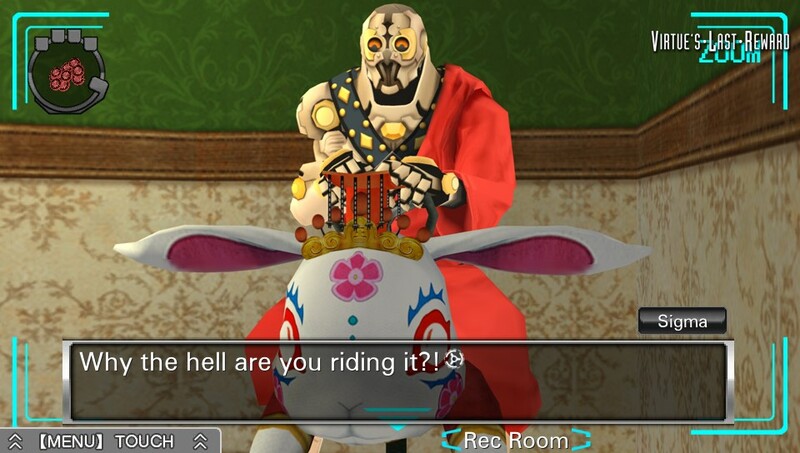 While VLR is a stand alone game, it is supposedly better if you have played 999 first. I heard this on the Giant Bombcast and decided to get a copy of 999. 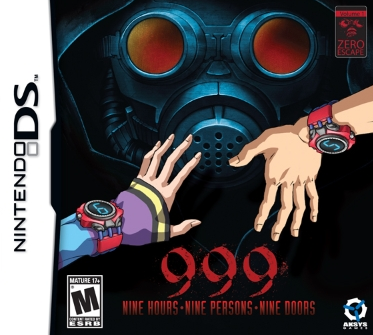 It turns out that 999 was never released in Europe. So via an Amazon importer I was able to purchase a US copy. It never arrived. An e-mail or two later and 4 days and my cart of 999 was finally in my grasp. 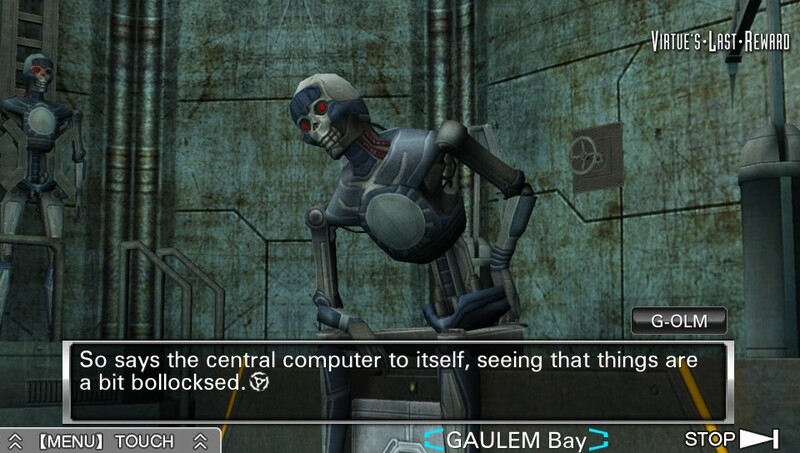 999 is a mixture of visual novel and point-and-click puzzling. For those that dont know, visual novels are kinda what they say they are. Some simple pictures onscreen and you click through a lot of text. Recent examples are Phoenix Wright and Professor Layton. In the game you play Junpei, a 21 year old student that has woken up on a ship. He initally cant work out whats going on but quickly remembers Zero (someone in a Helgasht outfit – they look pretty close!) abducting him. From here you meet up with 8 other characters, each having a braclet with numbers from 1 through 9. Here is where the title starts making some sense. There are nine people on the ship, you have nine hours till the ship sinks and you are told to seek out the 9 door. As this door is the way out of Zero’s game. Back to the braclets that people are wearing. The only way to remove them is to leave the ship, or have the wearers heart rate reach zero. Everyone on the ship has a different number on their braclet and this ends up deciding the code names for each of the characters. This is where the games obsession with numbers starts. There are locked doors that will only allow certain people to go through via the digital root system. The digital root can be found by totalling up the numbers from the users braclets until there is only one digit, for example the digital root of users 2,5 and 6 is 2+5+6=13 1+3=4 so the digital root is 4. There are several rules to these doors, between 3 and 5 people can go through a door, their digital root must match that of the door, everyone that scans their braclet in, must scan it out. 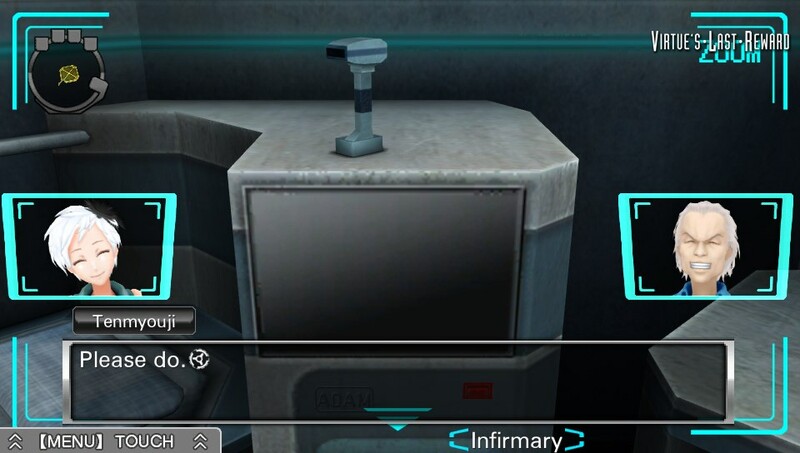 By scanning in/out they have to touch their braclet againts a machine that records their braclet number. Not too bad I suppose, but then add in a 81 second time limit from scanning in to scanning out. If they dont do this in the time limit, they explode. Yep, their kidnapper Zero has planted a bomb in them and the braclets are the detonators. If you arent into puzzles and reading lots of text, then this game is not for you. Its hard to talk about too much of the general story due to spoilers. There are multiple endings and going through these does shed light on certain events. But several of the endings just feel cheap. However, going through the main endings (you will probably need a guide unless your uber dedicated) is more than worth it. I just wanted a bit more out of the true ending before “that” final shot. I’d love to see an anime of this game, especially done in the style of Umineko no Naka Koro Ni or Amagami where after several episodes it gets restarted as that would mean it could go through all the plot lines. As long as it doesnt go all Endless Eight and repeat itself when it doesnt need to.